BRANDED A DOPING cheat at age 13, a kart driver is appealing a two-year ban to the Court of Arbitration for Sport. Igor Walilko of Poland is scheduled to give evidence at the Lausanne-based court today when his lawyers challenge the ban imposed by motor sport’s governing body, the FIA. Walilko was 12 when he tested positive for the banned stimulant nikethamide after an international kart race in Germany last July. It was the driver’s first doping test. Walilko’s lawyer Michael Lehner tells The Associated Press the case is “very difficult” for the teenager, who was a national junior champion. The FIA did not respond to requests for comment on the case. According to Walilko’s website, he began riding motocross bikes at four and followed his father, Rafal, into the sport. 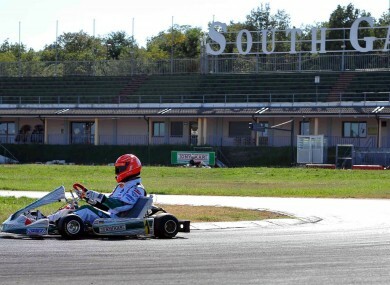 In 2007, Walilko started competitive racing in karts — the same route taken by Michael Schumacher and Lewis Hamilton on their road to become Formula One world champions. ”He has a lot of talent,” Lehner said. Walilko won the Polish junior title in 2009. He competed in Germany last season, piloting 125cc engines in KF3 class races. At the Ampfing circuit on July 18, he finished second in a 24-lap race, reaching speeds of 55 mph. German organizers took a urine sample after the race, and it showed traces of nikethamide. The World Anti-Doping Agency classifies nikethamide as a specified substance that allows for explanations of accidental use — if an athlete proves how it was consumed. The FIA anti-doping panel looked at Walilko’s case in Paris last October before imposing the two-year ban. “Yes, he knows doping is forbidden … (but) for a 12-year-old child it’s not easy to understand complicated rules,” said Lehner, a specialist in sports doping cases. However, WADA said it studied the case and accepted the FIA’s verdict. “WADA reviewed the sanction… and has decided not to exercise its independent right of appeal to the CAS, as it is in compliance with the World Anti-Doping Code,” it said in a statement to the AP. The CAS panel is expected to give its ruling within the next few weeks. Lehner said he would argue that Walilko was below the age of criminal liability in Poland, with the Youth Olympic Games closed to athletes younger than 14. Email “13-year-old karting champ appeals doping ban ”. Feedback on “13-year-old karting champ appeals doping ban ”.